We like to mix up our routes quite a bit, and while we have done this before, it has been a very long time. As I’ve said a few times, this is one of my personal favorite routes. It offers a great mix of hill lengths and steepness, and also provides some twisty downhill challenges to push our bike handling skills. I removed the “most complained about hill” from the route (the dreaded Las Planideras), since it’s pretty easy to avoid and well, life is short. I’m pretty sure it’s safe to say we all had enough climbing as it was. 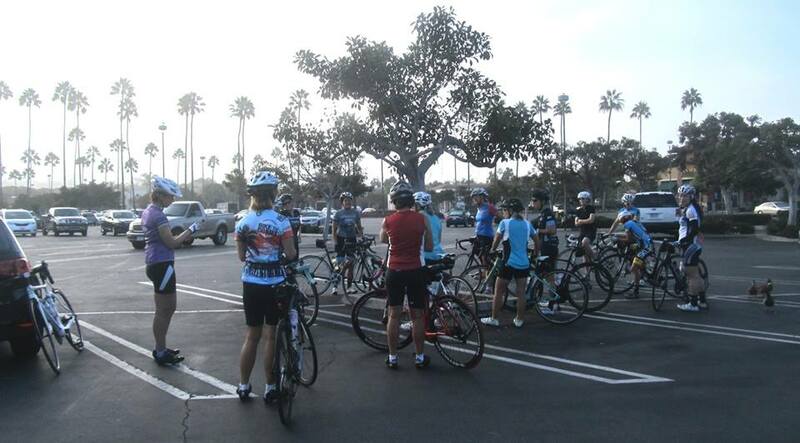 We had about 18 total on Saturday morning, fairly evenly split between the three ride leaders. I was the leader of the A group, and at first, I kind of felt like the kid in elementary school sitting on the sidelines not getting picked to play. A few hearty souls said they would join me, and then a few more gave in to peer pressure to make a nice group of five, whereas the other groups filled out with the remainder of the riders to be led by Jill (B) and Michell (C). You may note the lack of pictures from the A ride. This is partly because I am fairly terrible at taking pictures while I ride (unlike the true experts, Jill and Michell), and partly because we were pretty busy keeping up a steady pace throughout the ride. It was such a great workout, I was literally wiped out all afternoon, following lunch – which I didn’t get until about 3:00 pm, causing Lucy (my daughter) to coin a new term, “crangry” … you all may have heard of “hangry” (hungry angry). Lucy said I’d gone clear past mere anger, and was fully in the crazy zone. I was. Here’s a picture from a few weeks ago that I love, and it’s Melina and Lauren, who were begrudgingly pushed to ride with me this week – we can pretend it was from last Saturday. Jill is a fantastic leader, whether it’s the A, B or C group, and she generally gathers a pretty large following. It might be partly because she takes such great pictures of people, not sure. 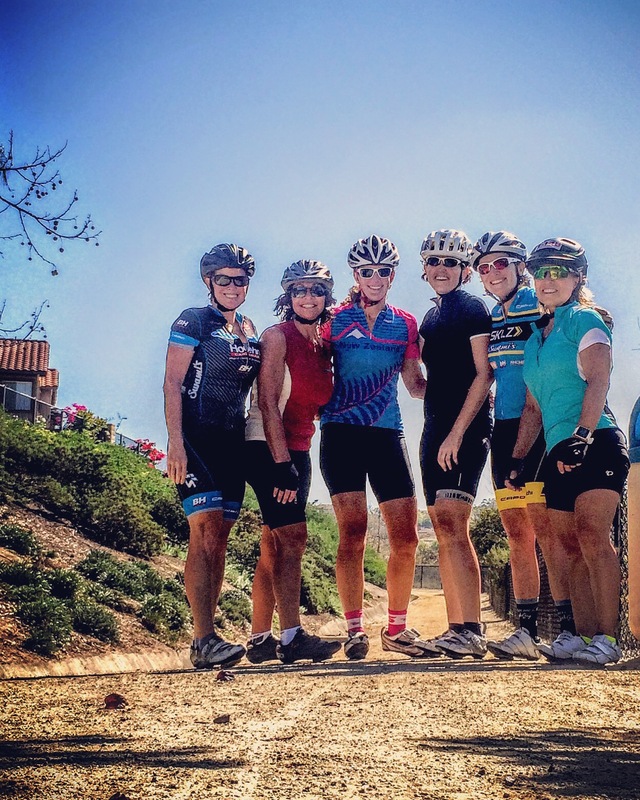 Here’s the B group stopping for a picture on the non-sanctioned dirt route Heather Krauss forced them on (ha!) – that was not on the original route! Jill, Sophie, Dena, Jill Q, Heather K, and Miki. Chin had headed home pre-picture. 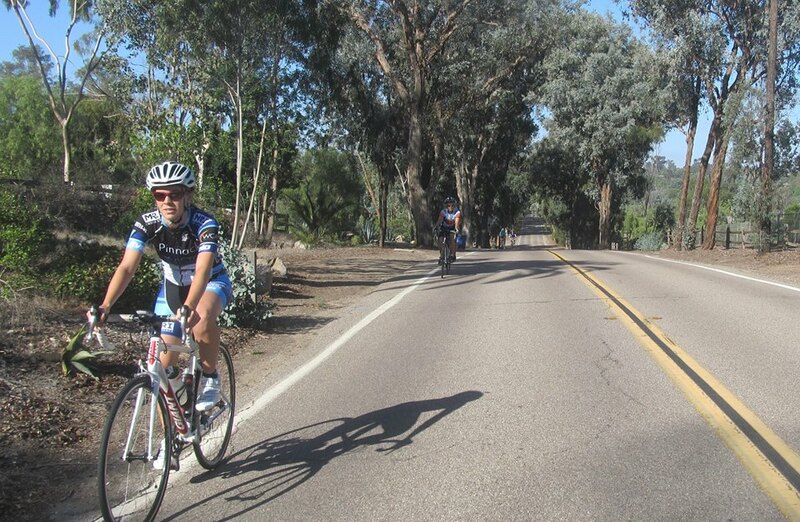 Michell is always a wonderful leader and does a great job with our newest riders in the C group. Handy in bike maintenance, an expert in bike safety, and fairly amazing with her camera while riding, we are always happy when Michell makes the long trek up from North Park to join our group. She also always does a timely summary of her ride (i.e., day of, not many days later like some of the other leaders… i.e., me). Everyone enjoyed C route through Rancho Santa Fe, I think, though the narrow run in via Manchester Rd was a bit testy (a few drivers were trying to get themselves into the ‘either head on collision or squeeze the bikes off the road’ situation just because they didn’t want to slow down for 5 seconds for better sight-line thru the curves), but the rest of the ride was traffically pretty uneventful. We were enjoying a respite from climbing and traffic on beautiful Stud Loop when I spotted a golf cart with two dudes in it approaching the road from a villa driveway, so I gave ’em a bell ring and a cheery ‘Good morning’. The passenger turned to wish us a good morning back, and lo and behold, it was none other than Phil Mickelson on his way for a wild dimpled ball chase! grin emoticon I was quite sorry that Miki, our resident golfer, had gone with B group instead and wasn’t around to see a local golf god. I think I’ll be nagging her about it for the rest of the year. Bwahahahaha! 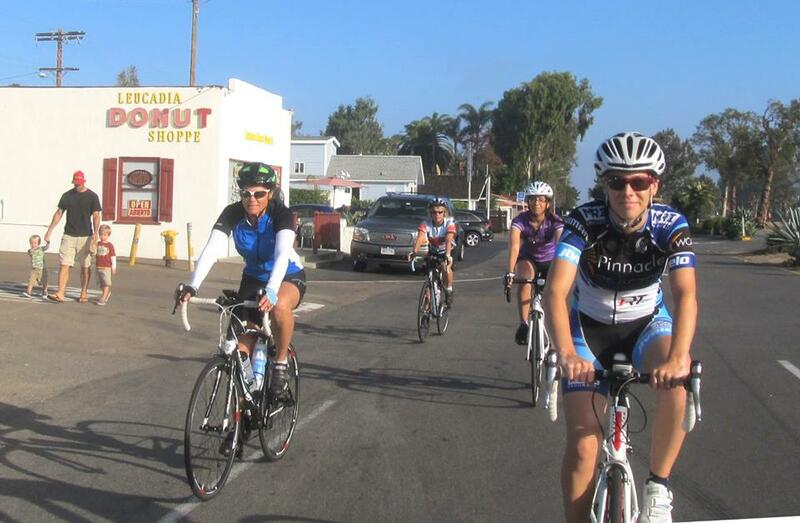 Michell managed to capture both the C group and her later stop, the Leucadia Donut Shop. 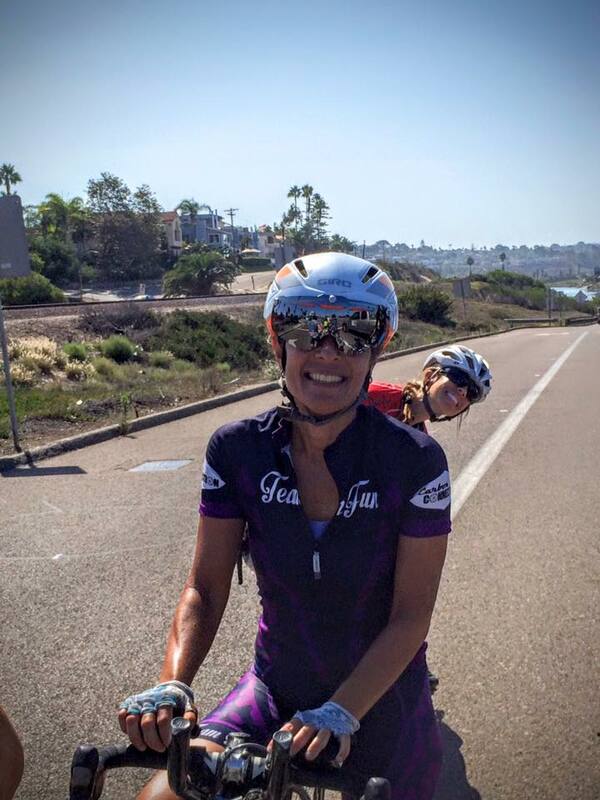 We hope many of you can join us this Saturday (10/3), with our inaugural ride from Nytro Multisport in Encinitas. We will still have three ride leaders, and expect the rides to be the same as always – great company, interesting routes, and a satisfying workout for all levels!